Already popular on Spotify and a fan favourite at Tiësto’s recent Hakkasan Las Vegas performances, his latest track ‘Say Something’ is now available to own via Casablanca Records. As a fan of many different genres, Tiësto explores the dance music space and uses his DJ sets, Musical Freedom Records and Sirius XM Club Life channel as a platform to support everything from big room, deep house, trap and most everything in between. 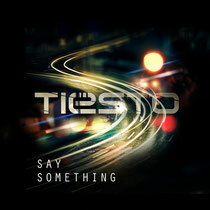 On this occasion ‘Say Something’ reflects Tiesto’s love and appreciation for dance music’s deeper side. Tiësto continues a summer long celebration of his new album, ‘A Town Called Paradise’, with performances at Made In America on 31 August and Global Citizen Festival in New York City’s Central Park on September. To commemorate album singles ‘Wasted’ [featuring Matthew Koma] and ‘Red Lights’ reaching Gold status (certified by the RIAA for digital sales in excess of 500,000), Tiësto will host The Gold Party as part of his CLUBLIFE residency at Hakkasan Nightclub in Las Vegas on Friday 12 September. That night, he will also personally debut the video for his new single ‘Light Years Away’ [featuring DBX].